Buddhism is religion that is based on the teachings of a prince who, 2,500 years ago, was so shocked by the suffering he saw in the world, he set out to find permanent solutions to things like death, disease and old age. The prince’s name was Siddhartha Gautama, who was later known as the enlightened one, or the Buddha. Buddhism is widespread in South East Asia and has many followers in the western world as well and the religion pre-dates both Christianity and Islam. If you've ever wondered what Buddhism is all about, then read these ten interesting facts about Buddhism that you may not have known. Siddhartha Gautama, later called the Buddha, was born a Hindu prince. Hinduism is the oldest religion on the earth but Siddhartha Gautama felt that it didn’t provide him with all the answers, so he went on to seek his own truth and enlightenment. Buddhists do not see Buddha as a God, as many people think, but they see him as a teacher. He is revered as a spiritual guide and Buddhists look to Buddha for guidance and wisdom. Vegetarianism is not an absolute requirement for a Buddhist, though most schools of Buddhism do preach non-violence and do encourage students to become vegetarians. Buddhism does prescribe that no living being should be killed, but eating the meat of an already dead animal is permitted. The Dalai Lama is not the equivalent of the Pope of Buddhism. The Dali Lama, who is believed to be the reincarnation of the pervious Dali Lama, is revered primarily by Tibetan Buddhists and followers of the Gelug School of Buddhism, but not all Buddhists. Many major schools of Buddhism believe that there will be another Buddha, or Maitreya, in the future. They believe that this Maitreya will return to the earth when the teachings of the original Buddha have been forgotten and he will teach the pure teachings, known as pure Dharma. 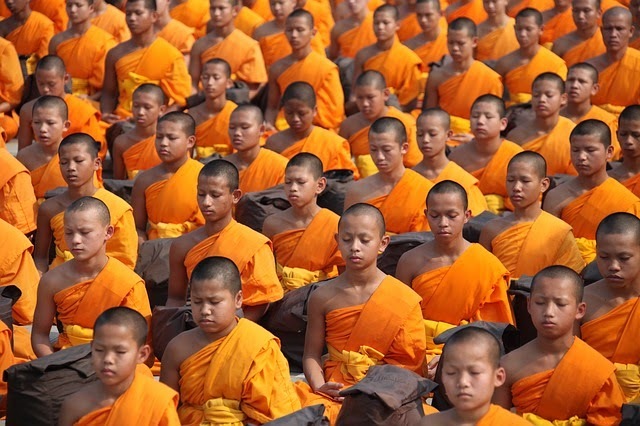 Buddhism is not limited to Tibbett and India; it is practiced in many countries around the world. The number of people following the teachings of Buddhism increases every year and it is the fourth largest religion in the world. Buddhists believe that it is harder for a woman to achieve true enlightenment than a man. Buddha was never portrayed as a woman, even though he is believed to have appeared in many different forms, and the Dalai Lama can also never be a woman. There is no such thing as an official Buddhism; it covers many different schools of thought. The various schools of Buddhism can vary quite considerably in their beliefs, including whether or not there is a God ad whether being a Buddhist means living a monastic lifestyle or embracing life. Just as the Christian and Jewish religions have their Ten Commandments; Buddhists have Five Precepts by which they live their lives. These are: Do not kill, do not steal, do not lie, do not engage in sexual misconduct and do not use intoxicants. The statues that you see in Chinese restaurants of a chubby happy looking guy are not an image of Buddha. Buddha was actually a slim man and the familiar fat man was a Chinese monk called Buddai who achieved enlightenment. I researched and wrote this article as a part of my own efforts to come to understand the various beliefs and religions of the word a little better. If I have made any mistakes, then please do let me know in the comments.